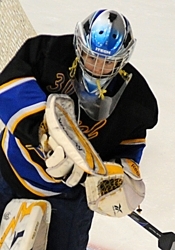 Junior goalie Jon Narverud started all three Section 8A games for the Prowlers (Photo by Tim Kolehmainen). There has been an unofficial catalog of accomplishments for Micah Ranum this winter. Call it his high school hockey bucket list. 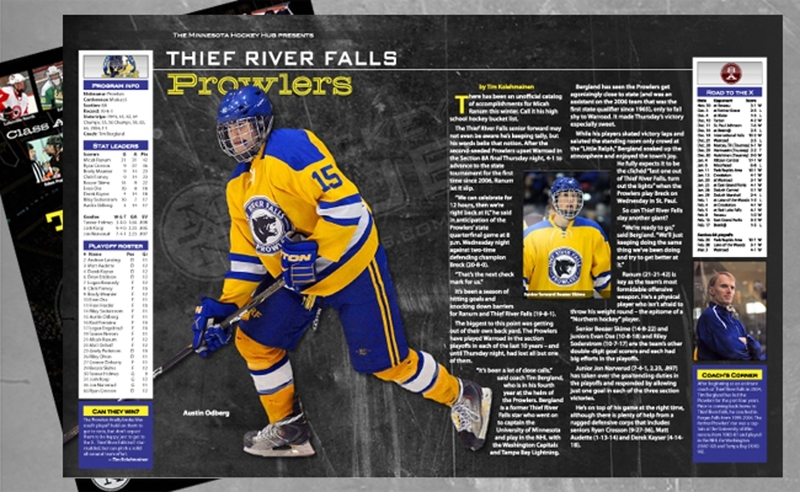 The Thief River Falls senior forward may not even be aware he’s keeping tally, but his words belie that notion. After the second-seeded Prowlers upset Warroad in the Section 8A final Thursday night, 4-1 to advance to the state tournament for the first time since 2006, Ranum let it slip. “We can celebrate for 12 hours, then we’re right back at it,” he said in anticipation of the Prowlers’ state quarterfinal game at 8 p.m. Wednesday night against two-time defending champion Breck (20-8-0). 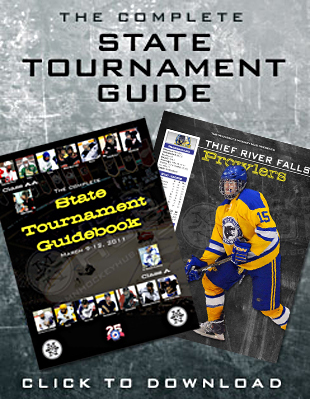 It’s been a season of hitting goals and knocking down barriers for Ranum and Thief River Falls (19-8-1). The biggest to this point was getting out of their own back yard. The Prowlers have played Warroad in the section playoffs in each of the last 10 years -- and until Thursday night, had lost all but one of them. “It’s been a lot of close calls,” said coach Tim Bergland, who is in his fourth year at the helm of the Prowlers. Bergland is a former Thief River Falls star who went on to captain the University of Minnesota and play in the NHL with the Washington Capitals and Tampa Bay Lightning. Bergland has seen the Prowlers get agonizingly close to state (and was an assistant on the 2006 team that was the first state qualifier since 1965), only to fall shy to Warroad. It made Thursday’s victory especially sweet. While his players skated victory laps and saluted the standing room only crowd at the “Little Ralph,” Bergland soaked up the atmosphere and enjoyed the town’s joy. He fully expects it to be the clichéd “last one out of Thief River Falls, turn out the lights” when the Prowlers play Breck on Wednesday in St. Paul. So can Thief River Falls slay another giant? Ranum (21-21-42) is key as the team’s most formidable offensive weapon. He’s a physical player who isn’t afraid to throw his weight round -- the epitome of a “Northern hockey” player. Senior Beezer Skime (14-8-22) and juniors Evan Ose (10-8-18) and Riley Soderstrom (10-7-17) are the team’s other double-digit goal scorers and each had big efforts in the playoffs. Junior Jon Narverud (7-4-1, 2.23, .897) has taken over the goaltending duties in the playoffs and responded by allowing just one goal in each of the three section victories. He’s on top of his game at the right time, although there is plenty of help from a rugged defensive corps that includes seniors Ryan Crosson (9-27-36), Matt Audette (1-13-14) and Derek Kayser (4-14-18). The Prowlers finally broke Warroad’s playoff hold on them to get to state, but don’t expect them to be happy just to get to the X. Thief River Falls isn’t star-studded, but can pitch a solid all-around team effort. After beginning as an assistant coach at Thief River Falls in 2004, Tim Bergland has led the Prowlers for the past four years. Prior to coming back home to Thief River Falls, he coached in Fergus Falls from 1999-2004. The former Prowlers’ star was a captain at the University of Minnesota from 1983-87 and played in the NHL for Washington (1987-92) and Tampa Bay (1992-95).